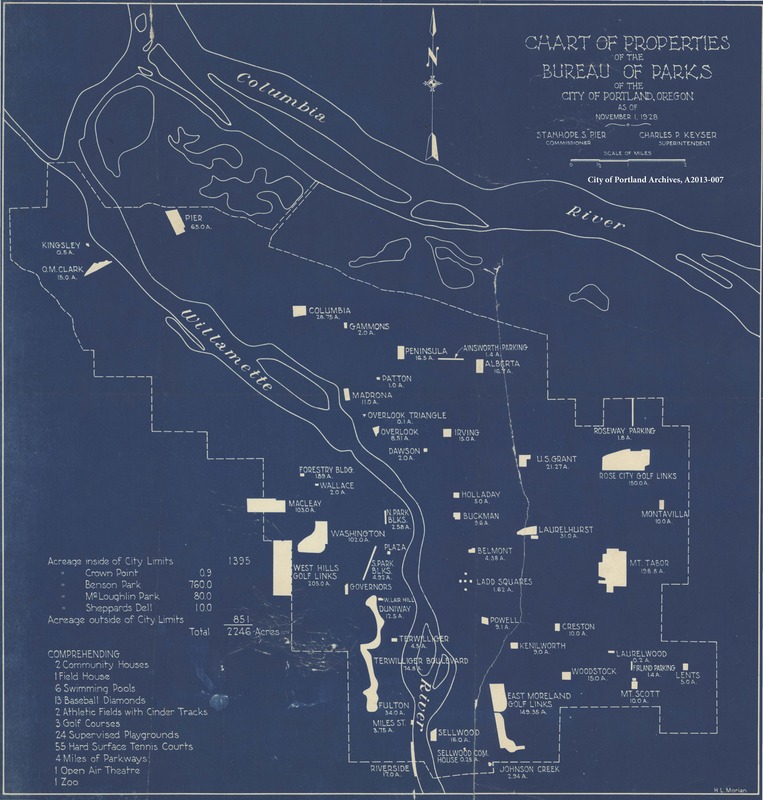 “Chart of Properties of the Bureau of Parks of the City of Portland,” Oregon, 1928. City of Portland (OR) Archives, A2013-007. View this map in Efiles by clicking here. Must have been pretty cool for Stanhope Pier to see a park named for himself on the map. Was there another Shepperds Dell inside the city limits? Interesting the city owned park land in the Columbia Gorge — Crown Point, Sheppard’s Dell, Benson Park. Also this map shows before Forest Park was consolidated. How many parks have been created since 1928? I notice that Kern park (SE 66th and Center) is missing. That must have been a later addition. East Moreland golf course is city owned? My greatgrandfather donated the tract of land around Shepperds Dell to the city in 1915. Interesting the legend on this map states the Dell was within the city limits. Notice that West Moreland Park is also missing on the map. The city didn’t acquire the land for Westmoreland Park till 1936 so it would not be on this 1928 map. If you look closely at the map you’ll see Ainsworth Parking and Roseway parking noted on the map. At the time the Parks Bureau must have owned the center median on NE Ainsworth and NE 72nd. Now that is PBOT’s . And Firland Parking along SE 72nd between Foster and Holgate. Never heard that name for this parkway. Interesting they exist on both NE and SE 72nd. It does look a little confusing, but I’m pretty sure Sheppard’s Dell and the others are supposed to be the ones outside of city limits. The numbers add up to the outside figure. Also, not sure where the “Parking” came from, but Firland Parkway is an official name.